Well. On the heels of yesterday’s “ENOUGH!” battle cries, I completely forgot that Nora Beth was scheduled for her 15 month check up and vaccinations and no-showed it. I also forgot a work meeting. And somehow I didn’t smell the dirty diaper adorning my child for, ooooh, 3 hours, resulting in a massive rash and lots of tears. So. Neat. But! But! 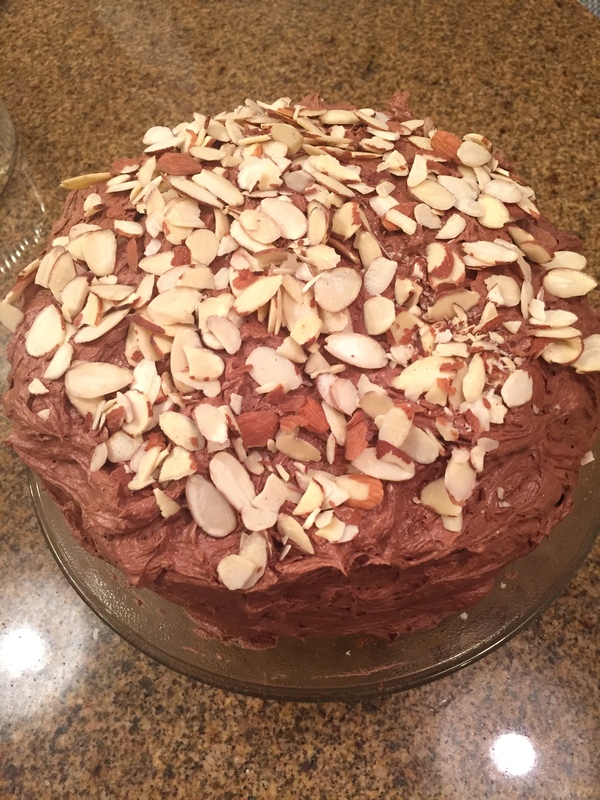 There was leftover cake… specifically this one, that I made for Easter. As I told Davey… it looks like a tomb, but it tastes like resurrection. I was pretty right about that. Preheat oven to 350°. Grease 3 (9 inch) round cake pans. Cream butter and 2 sugar together in a standing mixer until light and fluffy, about 7 minutes. Add the eggs, one a time, beating well after each addition. Add the flour and milk, alternately, beginning and ending with the flour. Mix in almond and coconut extract. Divide the batter among the 3 prepared cake pans. Bake for 25 minutes, until a toothpick inserted into the center of the cake comes out clean. Cool on wire racks for 10 minutes, then remove cakes from pans and cool completely on the wire racks. Beat cream cheese and marshmallow fluff until light and sweet. Mix in coconut flakes to taste. Spread between cake layers. Cream together butter and cocoa powder until well-combined. Add sugar and milk to cocoa mixture by adding 1 cup of sugar followed by about a tablespoon of milk. After each addition has been combined, turn mixer onto a high speed for about a minute. Repeat until all sugar and milk have been added. If frosting appears too dry, add more milk, a tablespoon at a time until it reaches the right consistency. If it appears to wet and does not hold its form, add more confectioner’s sugar, a tablespoon at a time until it reaches the right consistency. Ice cake once cooled. Top with slivered almonds, if desired.